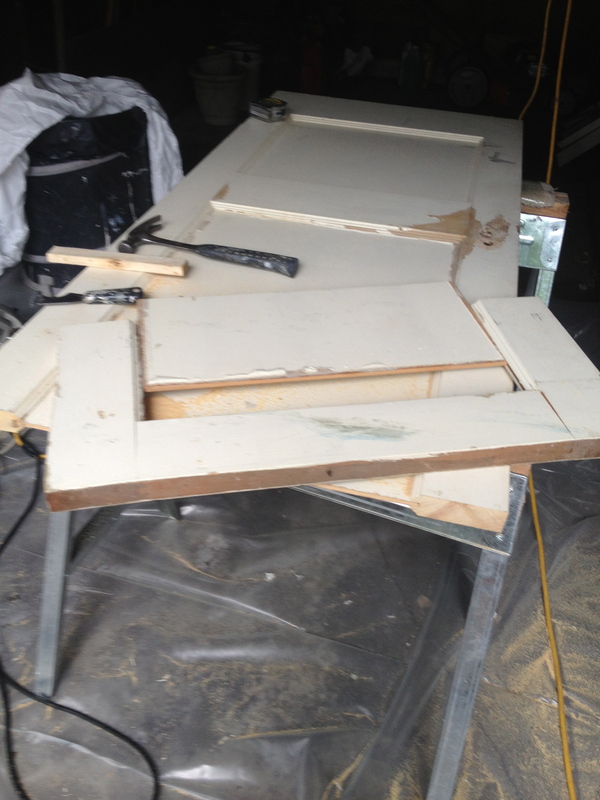 How to Build a Dutch Door. I’ve worked near a number of toddler ranches. They’re full of bright toys, padded flooring or map carpets and usually at least one molded plastic, rounded off for safety, mini jungle gym. It’s the kind of place you’d feel most at home in socks. These spaces are usually in a room with a baby gate, a family room with a big baby gate or some times an area across a couple rooms outlined in metal panels one step fancier than a dog kennel. All for the ever lasting toddler. Then, there’s the dutch door. The easiest of all toddler ranch containers. Dutch doors are seen less often on toddler ranches, but I think way easier to live with. By the way, did I mention dogs, cats and other pets are toddlers too? I built a dutch door for a toddler rabbit one time. The rabbit was welcome in the house, mostly because it kept coming through the dog door to the back yard. The rabbit had a fine hut in the back yard with straw, snacks and a cat friend. The rabbit preferred the second floor carpeting over the hut. Since the rabbit wasn’t such a good house guest when visiting the second floor the homeowner opted for a baby gate at the kitchen door. Baby gates are great for people in the baby raising years, but for the rest of us they are mostly a trip hazard. What the customer really wanted was a dutch door. Some dutch doors are a bottom half and a top half. These doors freak out parents, and for good reason. The two doors can become a pinch point where they meet. But this called for a bottom half door only. The customer would be able to view over the door and see the front door from the kitchen, and, view over the door from the entry way and see the back door to the kitchen. Perfect. The house was built in the thirties, the kitchen had two doorways into the house. One had the original service door swinging both ways and a passage door to the entry hall. The stop and hinge mortises were still in the passage opening but the door was gone. This is where the door search began. I started gearing my head up to go to the local re-purposing warehouse when the customer mentioned a door in the basement. We found the door. It was a counter top for an old steel base cabinet in the basement. It had paint rings all over the top and what appeared to be a battery acid spill. The other side of course was great. We hauled the door upstairs and confirmed it to be the original door for the opening. In our industry we refer to that as good luck. It gets better. 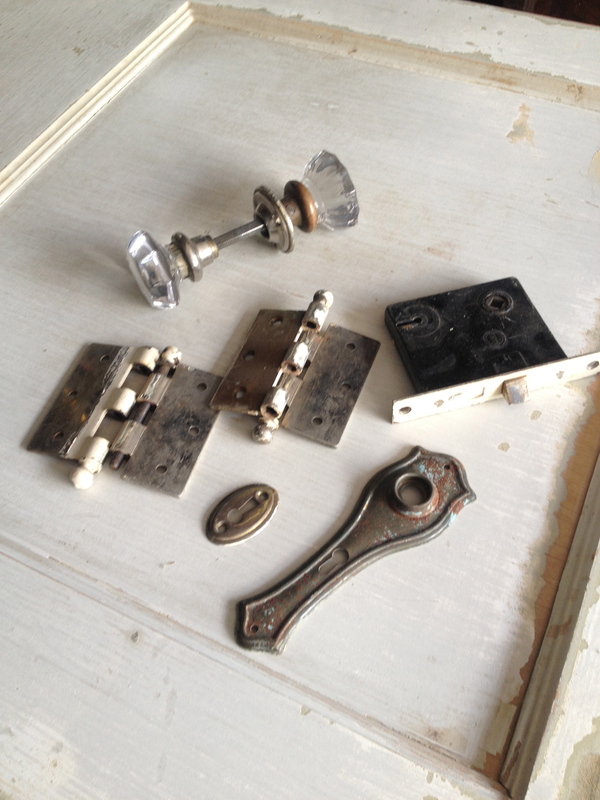 We also found the mortise lock set, the knobs and escutcheons, and even the hinges. Bam! It doesn’t get any better. 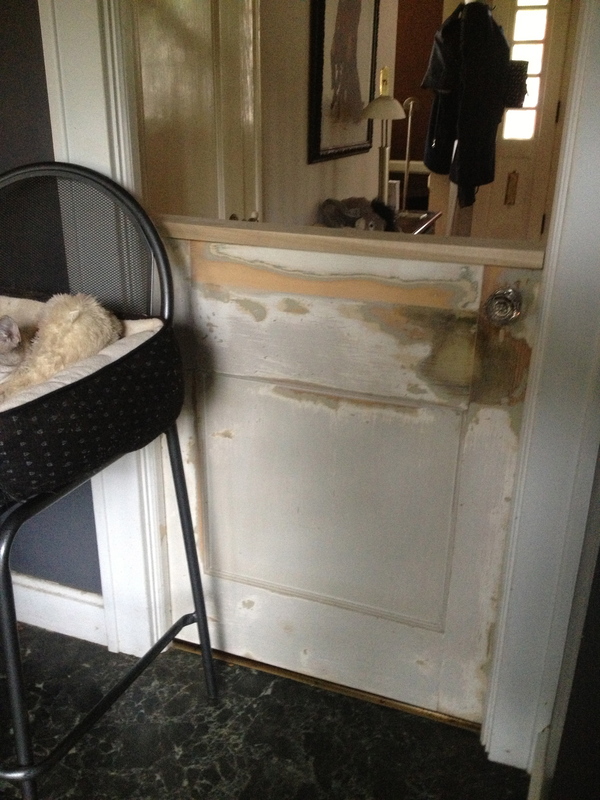 There’s a lot of ways to create a dutch door, here’s how I got this one done for this house. 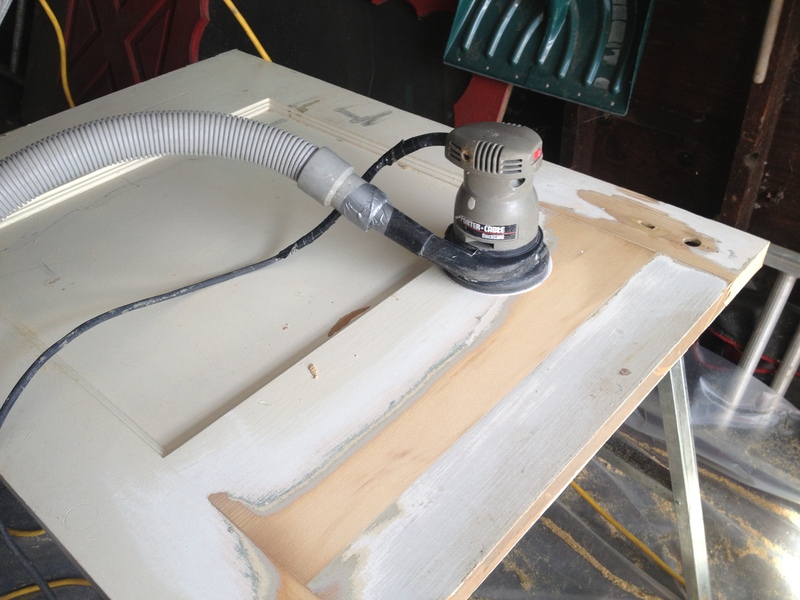 I set up a work site to handle lead paint sanding and cutting. Got the door up on the padded saw horses and went to town. First thing, scrape and vacuum away the weird acid burn to avoid too much of that stuff. Pull all the nails and screws, especially from the bottom where a sweep was. Then start cutting and re-fitting. My job was to move the top rail (the top horizontal piece ) down to just above the door knob. This brought the door down to a nice height without crowding the doorknob. 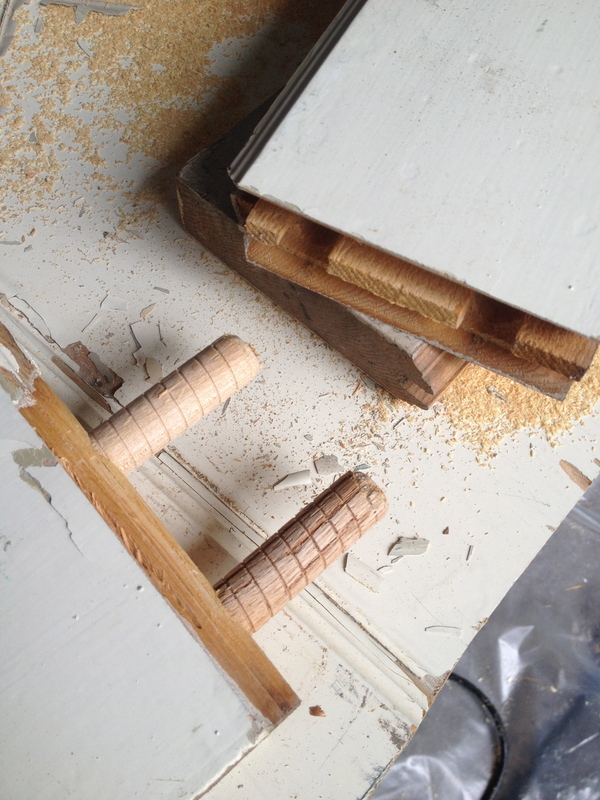 I cut away the top eighteen inches of the door and carefully started to break the joints. 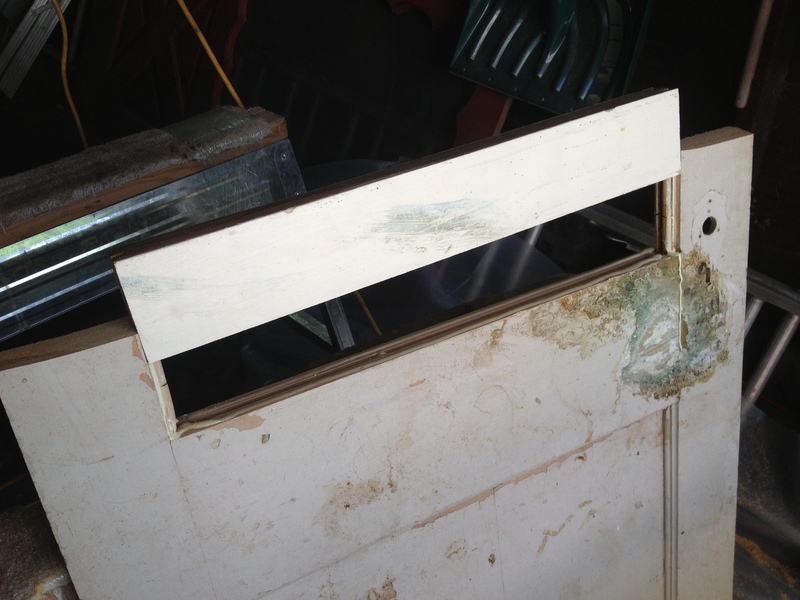 The door was well made with two dowel pins per joint. I don’t hammer and batter. I like to take things apart carefully. I worked the panel out of the middle and carefully disconnected the stiles from the top rail. 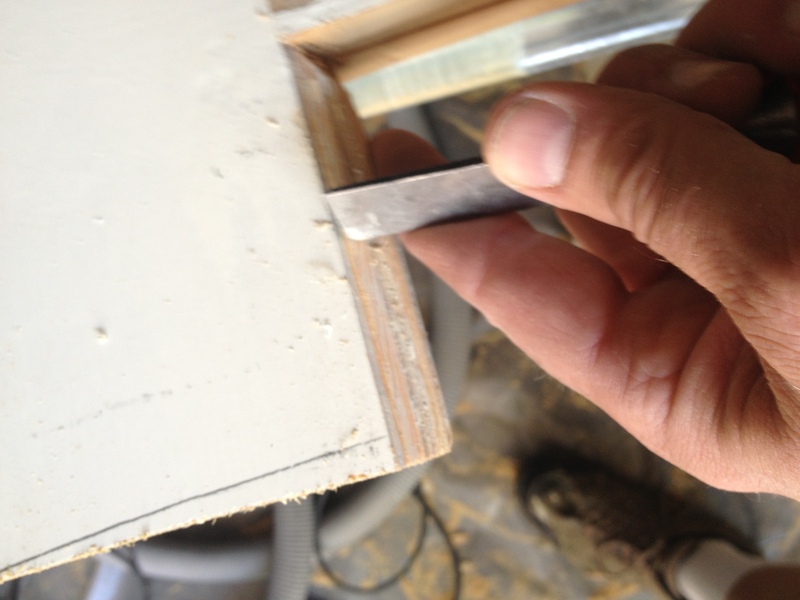 I used a table saw to cut the top rail profile flush to re-glue it to the middle rail above the door knob. Then I carefully cut and removed the remaining panel on the lower half of the door. The next step was to mark and cut the center rail to accommodate the re-installation of the top rail onto the middle rail. Once everything is scraped and sanded of extra glue and paint start to slide the pieces together to form a tall center rail. The dry fit should be snug but the pieces should not have to be driven hard to re-assemble. Once the dry fit is good, put glue on both surfaces and move the pieces together. Add a couple of clamps. I like to let these kinds of things dry for a couple hours before I start messing around too much more. I go to lunch, do a couple more things on the customer list and then come back to the door. I sanded the door with eighty grit on a random orbit sander with a shop vac attached for dust collection. I sand out the new joints first to flush them out. This is where it gets fun. Sanding an old door brings everything into focus. The quality of the modification, the condition of the lumber and of course the dozen or so marks and dings from eighty years of use. There’s a mark where the door opened onto another door in the hall, marks at the bottom where a variety of door stops had been used over the years. Dog scratches, coat hanger marks and what appeared to be a few wrist rocket marble pocks. Come to find out people living in the house seventy five years ago had the same things going on as we do now days. Sanding brings the eye to all of these. I like to sand once to get to know the door. Fill all the big offending marks with wood filler, let it dry or set up and sand again. At this point I’ll fill a few more imperfections. I do this as many times as each particular customer expects. 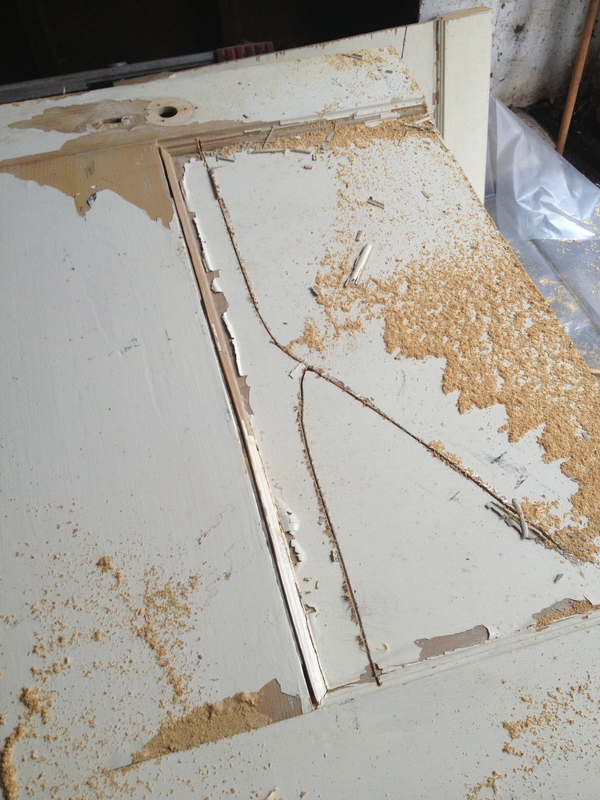 Some customers want the door to appear nearly new, some like a few dings left behind for character. This door was the latter. After about three fill and sands I finished it off with a one-twenty grit sanding for good measure. Once this is all done I started to re-fit the original hardware. This was easy and I only had to cut one mortise for the top hinge on the door edge and the frame edge. I bought brass screws to keep things authentic and installed the door. Bam. First swing. Door latched and felt pretty good. I made one adjustment to the top hinge to make the door to stop line just right, then installed the rest of the screws to finish things off. I cut a top stool out of five quarter lumber. Five quarter is about one and an eighth thick. This looks just a little more substantial than three quarter inch wood. Glue and finish nail the stool on and the door is good to go. The door came out great. The customer elected to prime and paint it herself, so my job was done. The door is way more comfortable to use than a baby gate, and, is more formal. This is just another simple way to make a space in a house a little special without too much work or expense. This is also a great job for homeowners to do on their own. It requires very few tools, is a modest challenge and doesn’t take a lot of space. It’s also the kind of job that requires some carefully sanding and fitting which is therapeutic. I have to admit, I was glad to drag that door out of the basement and see it doing it’s thing again.